Citation: C N Trueman "Operation Barbarossa"
Operation Barbarossa was the name given to Nazi Germany’s invasion of Russia on June 22nd 1941. Barbarossa the largest military attack of World War Two and was to have appalling consequences for the Russian people. Three army groups attacked Russia on June 22nd 1941. Army Group North, led by von Leeb, Army Group Centre, commanded by von Bock and Army Group South commanded by von Rundstedt. 40 divisions; 14 Rumanian divisions; Hungarian Army Corps and Luftflotte IV. Russia was defended by four army units. Though Russia had a large army, the purges had wiped out a considerable part of the army’s senior commanders. Totalled 26 Divisions including 6 armoured ones. Totalled 36 divisions including 10 armoured ones. Totalled 14 divisions including 2 armoured divisions. In total, Germany amassed 117 army divisions for the attack excluding Rumanian and Hungarian units. In total, Russia amassed 132 army divisions for the defence of the ‘motherland’, including 34 armoured divisions. Plans for the attack on Russia had been around since 1940. It is now thought that Hitler lost interest in theBattle of Britain as he was far too focussed on his desired attack on Russia. The first version of the plan was done by Marcks in August 1940. He envisaged a massive attack on Moscow – his primary target. He also wanted a secondary attack on Kiev and two masking attacks in the Baltic towards Leningrad and in Moldavia in the south. After Moscow had fallen, Marcks wanted a drive south to link up with the attack on Kiev. The attack on Leningrad was also a secondary issue. The next version of the plan was completed in December 1940 by Halder. He changed Marcks plan by having three thrusts; a major one against Moscow, a smaller attack on Kiev and a major attack on Leningrad. After taking Moscow and Leningrad, Halder wanted a move north to Archangel. After Kiev had fallen, he envisaged a drive into the Don/Volga region. The third and final variant was Hitler’s plan which he codenamed Barbarossa. This plan was constructed in December 1940. For Hitler, the primary military activity would take place in the north. Hence Leningrad became a vital target as did Moscow. His drive in the south was confined to the occupation of the Ukraine to the west of Kiev. By Day 17 of the attack, 300,000 Russians had been captured, 2,500 tanks, 1,400 artillery guns and 250 aircraft captured or destroyed. This was only in the territory attacked by Army Group Centre. To any military observer, the Russian Army was on the verge of a total collapse and Moscow seemed destined to fall. In fact, the German advance had been so fast that it had compromised the whole army’s supply and communication lines. The Army Group Centre paused on the Desna but it was still thought that it was only catching its breath before moving inexorably on. However, it was now that the German army was compromised by its own leader – Hitler. He ordered that the Army Group Centre’s Panzer Group led by Guderian should move south-east on to Kiev. 1 Panzer Group was also ordered north. This took away from the Centre group two of its most potent fighting forces. Guderian was very angered by this order but Hitler had always proved himself right in the war, so why argue with the Führer? Who, in fact, had the courage to oppose Hitler? Hitler had recognised that his most difficult decision was what to do after his forces had broken through the Stalin Line – move north, south or continue east? The mechanised sweeps north and south had the same massive success as the initial assault on June 22nd. 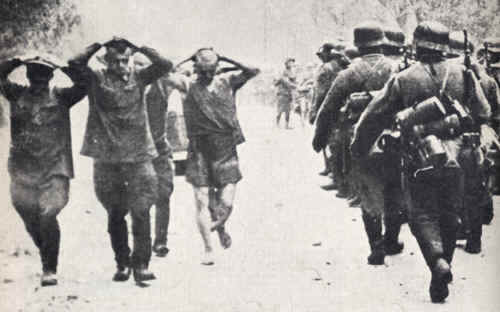 Masses of Russian prisoners were captured and vast quantities of Russian equipment was destroyed. But the orders of Hitler had one dire effect – loss of time. The delay was such that the impact of the winter occurred before the Germans had reached the objectives set by Hitler. Very few in the German Army were equipped to cope with the cold and the army, so used to advancing, found itself very much affected by the freezing temperatures. A war of movement as seen so much in June/July 1941 became an attack blighted by freezing weather that would hinder any army let alone one so ill-prepared for such weather conditions.